Signature. Secret. Recipes. When Toronto foodie entrepreneur, former food editor and cookbook author Amy Rosen announced last year that she was following up Toronto Cooks, her bestselling compendium of recipes gleaned from some of Toronto’s top chefs, spiced up with her unique, insider’s take, we couldn’t help get excited. If anyone can get signature (read secret) recipes out of a chef, it’s Amy. And that’s exactly what she did, and she does it again – but this time, Rosen has taken a look at another of Toronto’s best assets, its diversity and multi-cultural pride. With Toronto Eats: 100 Signature Recipes From the City’s Best Restaurants, Rosen explores the city’s diversified palette, the surrounding areas of Toronto, from farm, to forest to a few lakes – wood nettle spatzle, anyone? – that give Toronto chefs inspiration for ingredients in developing standout menus unlike anywhere else. “With more than 100 recipes from 50 amazing chefs, several of whom were featured in the first book, Toronto Eats documents this progression,” writes Rosen. “Our city’s chefs represent the countless cultures, and their flavours and techniques that make up the culinary fabric of our city today.” Toronto Eats is as much a cookbook as it is a study of the city’s food scene and the minds that man the kitchens. 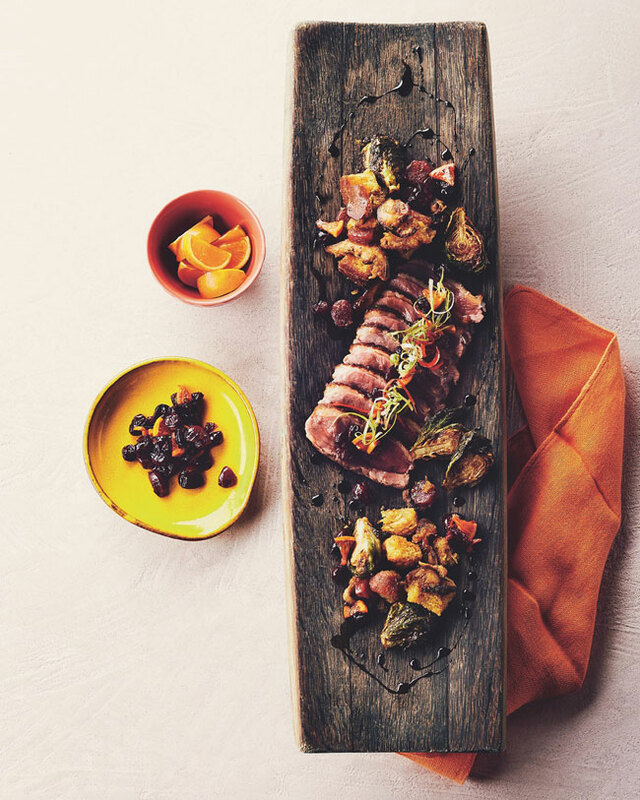 Even better, Rosen has been known to cook up a few of her own feasts, and she’s made sure that you don’t need to be Ramsay with a phalanx of sous chefs to make these menu ideas sing. Here, we’ve feature four recipes, a full menu, so to speak: Start with the Avocado Kale Caesar Salad from Carver, try the Peking Duck from DaiLo instead of a turkey for the holidays or a special occasion, stir up Carmen’s Paella when feeding a discerning crowd. And don’t forget dessert! Sierra’s insanely Awesome Brownies are just the ticket. Place avocado, lemon juice, avocado oil, and water into a blender and blend for 1 to 2 minutes, until smooth and creamy. Add Parmigiano-Reggiano, garlic, anchovy, and salt and purée for another 30 seconds, until well incorporated. (If mixture is too thick, add more cold water.) Refrigerate until needed. Makes approximately 1 cup. Preheat the oven to 400°F. Place bacon on a baking tray and bake for 7 to 8 minutes, or until crispy. Place kale and romaine in a large bowl, add dressing, and mix thoroughly to coat. Add a pinch of salt to taste, and add more dressing if desired. 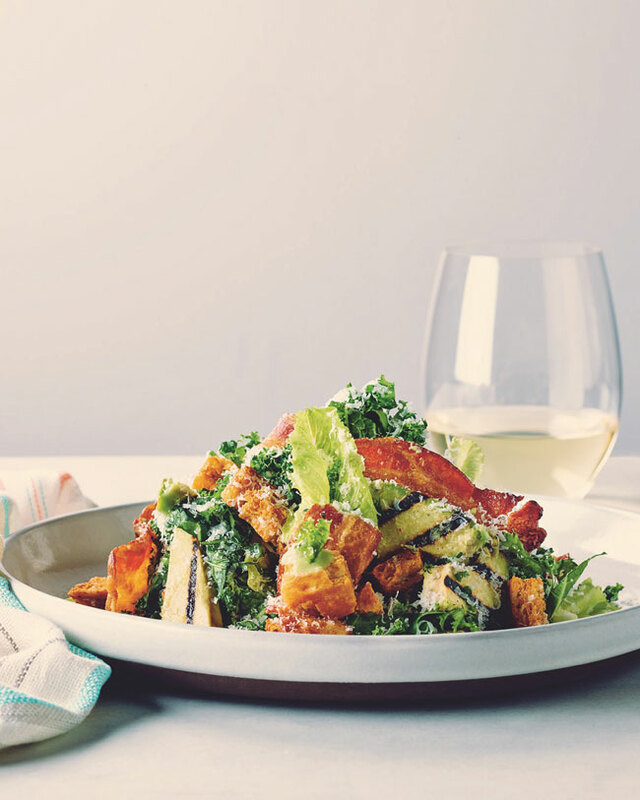 Place dressed leaves in a large serving bowl, sprinkle with Parmigiano-Reggiano, and top with avocado, bacon, and croutons. Serve with lemon wedges, if using. From Toronto Eats: Chef Liu smokes his Chinese sausage first to give the stuffing a nice smoky accent. If you have access to a smoker, he highly recommends it. Preheat the oven to 400°F. Place bread on a baking sheet and toast for 3 to 5 minutes, or until golden brown. Remove from the oven and set aside. In a large pot on medium heat, melt butter. Add onions and garlic and sauté for 1 to 2 minutes. Add mushrooms, sausage, and sage and cook for another 3 to 5 minutes. Add toasted bread to the pot, stir, and cook on medium heat for 5 minutes, or until bread is soft. Remove from the heat and stir in cilantro. Taste and adjust seasoning with salt and pepper, if needed. (Because salted butter is used in this recipe, it may not need extra salt.) Cover and set aside. Using a vegetable peeler, peel the zest of the mandarins and cut into short, thin strips. Set aside. Cut mandarins in half, squeeze juice into a bowl, and discard pith. Add orange juice and port to the bowl, stir, and set aside. Place sugar in a heavy-bottomed saucepan and drizzle in water and light corn syrup. (The corn syrup prevents the sugar from forming hard crystals.) Turn the heat to medium-high and stir sugar until it begins to melt. Allow sugar to boil. Do not touch or stir for 7 to 10 minutes, or until it starts to turn light amber. (If you feel the need to move the contents of the saucepan, gently swirl it.) Add cranberries and star anise, swirling them in the caramel. (The caramel is very hot, so be careful not to burn yourself.) When the cranberries begin to burst, remove the saucepan from the heat andpour in the juice mixture around the sides of the pan. Stir with a wooden spoon or silicone spatula to incorporate everything into mixture. Add mandarin zest to the saucepan, and salt and pepper to taste. Return the saucepan to the stove and simmer on low heat for 5 to 10 minutes, or until thickened. The compote will thicken when cooled, so try not to overcook it. Transfer to a heat-resistant container and cool to room temperature. Set aside until you’re ready for assembly. Heat the remaining 3 Tbsp of sesame oil in a cast-iron pan on high. Place duck breasts, skin side up, in the pan and sear for 2 minutes, or until golden brown. Using tongs, flip the breasts over on to their skin and reduce heat to medium-high. Add garlic, thyme, and butter. Sear for 5 minutes, basting every minute, until skin is golden brown and crispy. Remove duck from the pan and set aside to rest for 5 minutes. Using a pastry brush, glaze with sweet soy sauce. 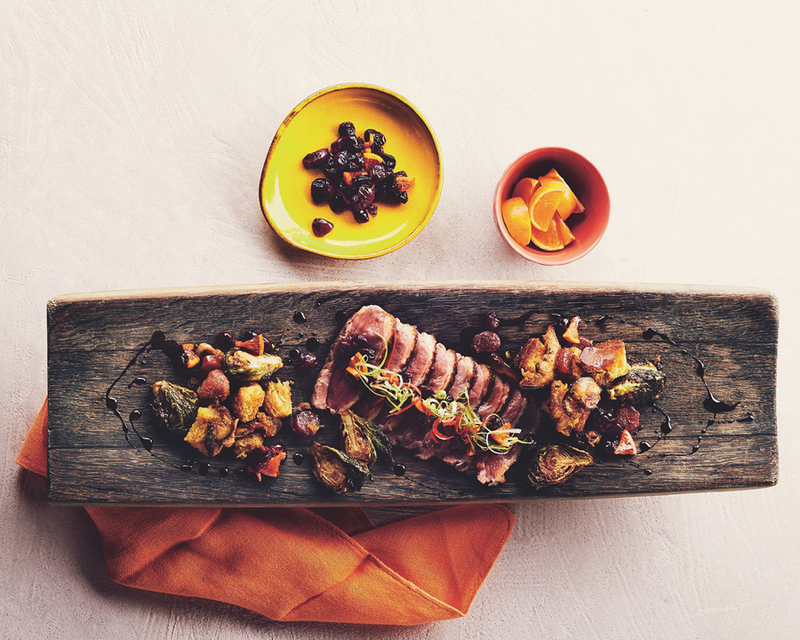 Thinly slice duck breasts with a sharp knife and fan out on a serving platter. Ladle sauce into a ramekin and place on the platter (or drizzle over the dish, if desired). Serve with a side of Asian bread stuffing and mandarin cranberry sauce and enjoy. Heat olive oil in a large paella pan or frying pan on medium. Add chicken and cook for 20 minutes, until well browned. Transfer to a plate. Add chorizo and cook for 2 minutes. Transfer to a separate plate. Add shrimp and cook for 2 to 3 minutes, until shells are opaque. Transfer to the plate of chorizo and set aside. In the same pan, add onions and cook on medium-low heat for 10 minutes, or until translucent. Add peppers, stir, and cook for another 10 minutes. Add garlic, zucchini, and snow peas and cook for another 10 minutes. Add paprika, salt, and saffron, and then stir in rice. Return chicken thighs to the pan, add 1 cup stock (enough to cover), and bring to a boil on medium-high heat. Gradually add remainder of stock, 1/2 cup at a time, and simmer for 10 minutes. Add snap peas, mussels, and clams, cooking for 5 minutes, or until clam and mussel shells have opened. 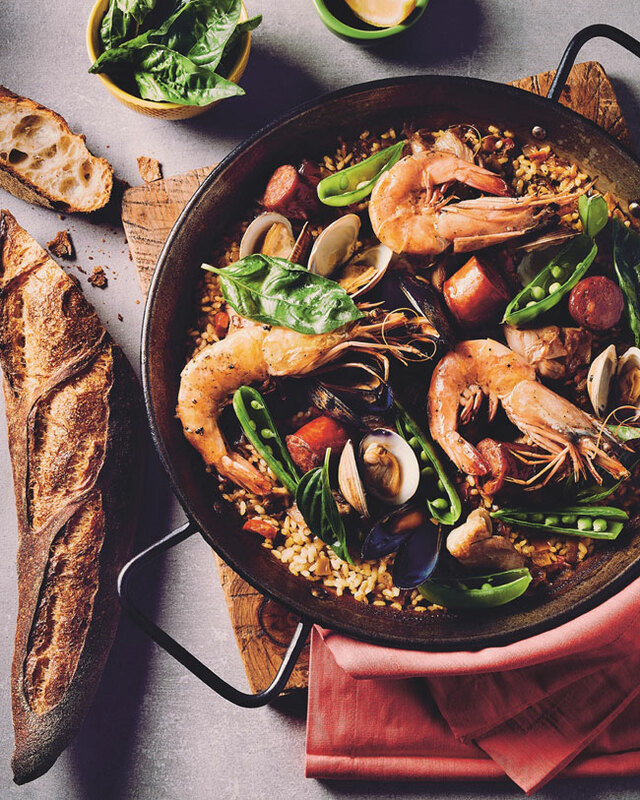 Leave the pan of rice undisturbed (to release the gluten in the rice, which gives the paella a nice starchy finish). Discard any clams or mussels that have not opened. Return chorizo and shrimp to the pan and cook for another 5 minutes. You want to build a light crust, known as socorat, at the bottom of the pan, which is the prized part of the paella. Turn off the heat and let the paella rest, covered, for 5 to 8 minutes before eating. Scatter basil leaves over the paella and serve with a lemon wedge, if using. From Toronto Eats – “The natural evolution of Ezra Braves’s obsession for all things coffee was to spread the gospel to others,” writes Rosen. “Braves also takes his baked goods seriously …. 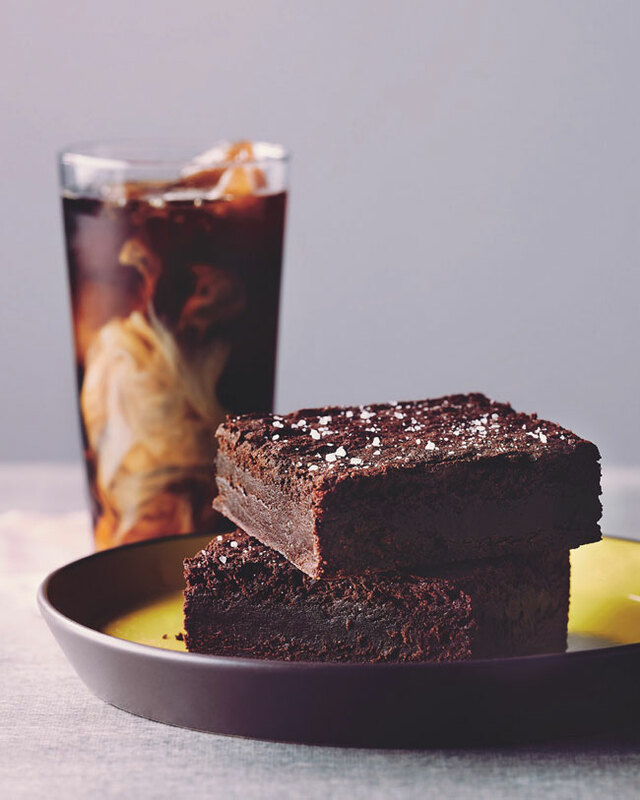 Bake a batch of Sierra’s Insanely Awesome Brownies and you’ll agree.” Tip: Pound uses coarsely ground coffee beans for an added flavour kick. Preheat the oven to 350°F. Spray a 9 x 13-inchrectangular pan with non-stick spray and line with parchment paper. In a double boiler, or a bowl set over simmering water, melt chocolate, butter, and salt and mix with a wooden spoon until well mixed. Set aside to cool. In a medium bowl, combine cocoa and flour. In a second medium bowl, whisk together eggs and sugar until pale and fluffy. Fold chocolate mixture into egg mixture until combined, then fold in flour mixture. Pour batter into the pan and spread out with a spatula. Bake for 35 to 45 minutes, until the top forms a crust. Garnish with flaked salt or kosher salt and crushed coffee beans.